Nearly all the Polish regalia were irretrievably lost during the final partition of Poland at the end of the 18th century. The Prussians, who in 1794, temporarily occupied Cracow (later incorporated with Austria), broke into the treasury of the Wawel cathedral and stole most of the regalia kept there. The spoil was then brought to Berlin and melted down during the financial crisis which faced the Prussian monarchy after the defeat of 1807-1808. 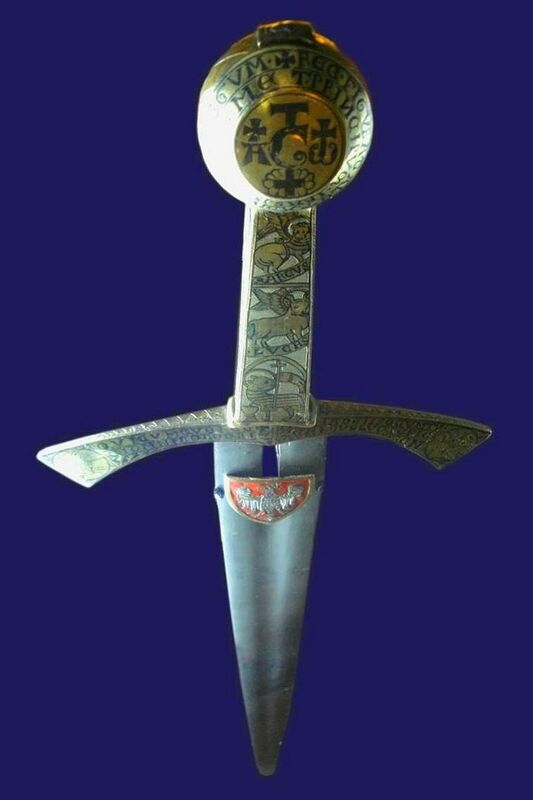 Among the few insignia1 that have survived the most important is the coronation sword called Szczerbiec (the Jagged Sword). According to legend it was the sword of the first Polish king, Bolesław the Brave, which he notched when striking the Golden Gate of Kiev taken in 1018. 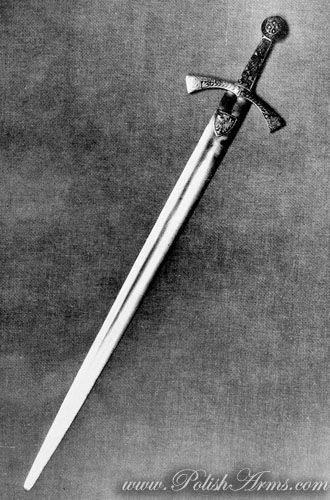 In reality, the sword was first used during the coronation of Władysław Łokietek (the Short) in 1320. After the plunder of the treasury in 1794, the sword got into the hands of private collectors, chiefly Russians, and finally was deposited in the Hermitage Museum of Leningrad. After 1920 the Polish antiquities which were in Russian collections were returned to Poland, among them being Szczerbiec. In 1939, to protect Polish antiquities against the Germans the most valuable items of the Cracow collection, Szczerbiec included, were sent abroad. Deposited in Canada they did not return to Poland until 1961. 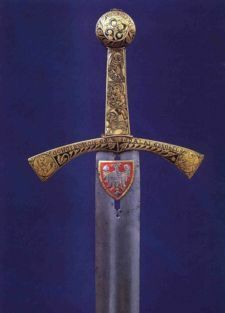 At present the coronation sword is again housed in the Wawel castle of Cracow. 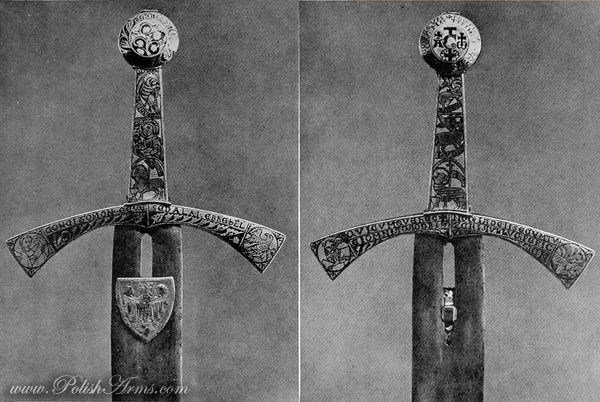 The sword, whose turbulent history provides a good illustration of the changeful fate of the Polish nation, is of great importance both as an historical relic and as a fine specimen of a medieval ceremonial weapon. Unfortunately it is little known outside Poland2.The overall length of the sword is 98.4 cm. The blade has a rounded point and a wide fuller on each side. The metal hilt is covered with plates of yellow metal (gold?) 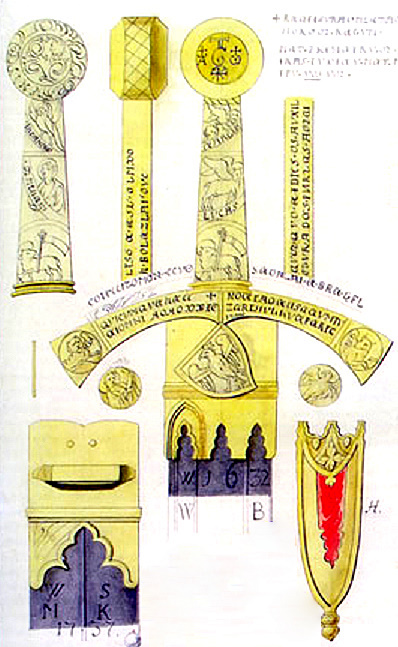 which bear plant ornamentations, religious inscriptions in Latin and Hebrew, the Agnus Dei and the symbols of the four Evangelists, all executed in niello. In the 19th century two (?) of the original plates were replaced by imitations which differ in colour and in technique. The surface of the blade shows traces of repeated and very thorough cleaning. The forte has a perforation within the fuller, probably caused by corrosion. The hole existed already in the 18th century, and its edges have been intentionally trimmed. It is partly covered by a coat-of-arms which formerly decorated the sword-sheath (now lost). The coat-of-arms, which bears a representation of the Polish White Eagle on a red back-ground, doubtless dates from the time of Władysław Łokietek. The literature, mainly Polish, devoted to Szczerbiec is abundant3. The subjects discussed concern the authenticity, chronology, and ownership of the sword. The first is no longer in question: everything seems to indicate that Szczerbiec is an authentic medieval sword and not a 17th century copy as has been maintained by some authors. The problems of chronology and ownership are less clear. The inscription on the blade is here of particular importance. The inscription which read Iste est gla[ius] Bolezlai due [is] no longer exists—it covered one of the plates which were replaced in the 19th century. Fortunately it is known to us from a very detailed description of the sword made in 1792. 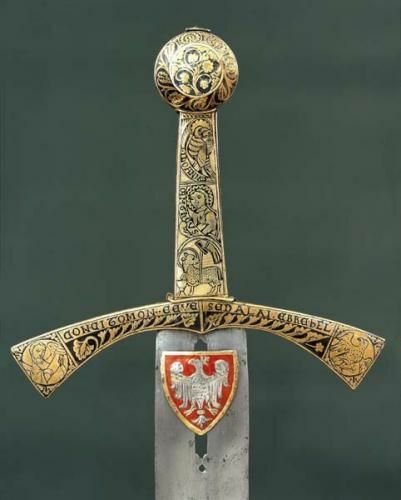 It indicates that the sword belonged to a prince Bolesław—certainly one of the numerous Polish princes of the 12th-13th centuries, a time when Poland was divided into a number of virtually independent duchies which were ruled by princes of the prolific Piast dynasty. In this case consideration should be given to the following: Bolesław Kędzierzawy (the Curly), ob. 1173; Bolesław, son of Mieszko, prince of Kujavia, ob. 1195; and Bolesław, son of Conrad, prince of Sandomierz and Mazovia, ob. 1248. Despite the opinion of several authors, the arguments are strongly in favour of Bolesław, Conrad's son. He was the childless uncle of Władysław Łokie1tek, and thus it is highly plausible that the latter would at his coronation use the sword which he inherited from his near kinsman. If we accept this hypothesis, then Szczerbiec should be dated to the first half of the 13th century. We think this date is opposed neither by the late Romanesque ornamentation of the sword hilt, nor by the style of the inscription which now can be only broadly defined as between 1175-1250. An analysis made by historians of arms may provide additional arguments. 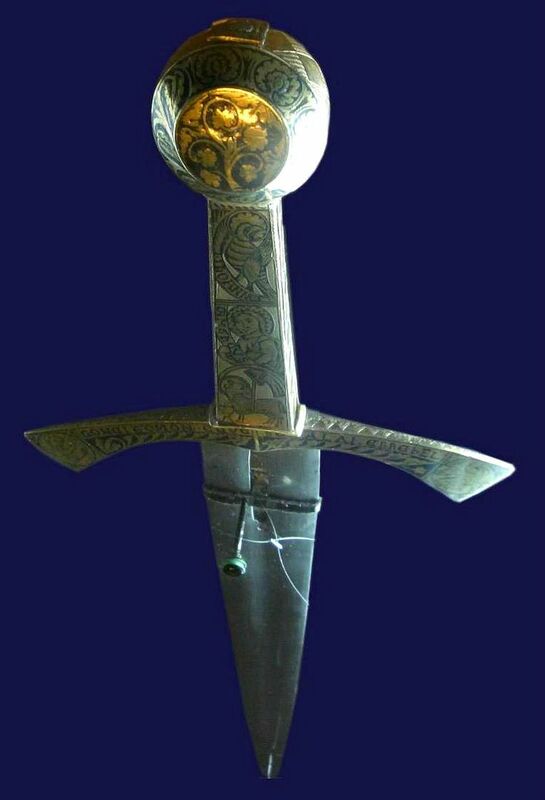 According to the typology of medieval swords as proposed by R. E. Oakeshott, the Polish coronation sword should be attributed to type XII, its pommel to type I, and the guard to type VI. All parallel swords which are published by Oakeshott4 date from the 13th century and mainly from its second half. This confirms our belief that Szczerbiec belonged to Bolesław, prince of Sandomierz and Mazovia. Little can be said of the workshop which produced the Polish coronation sword. 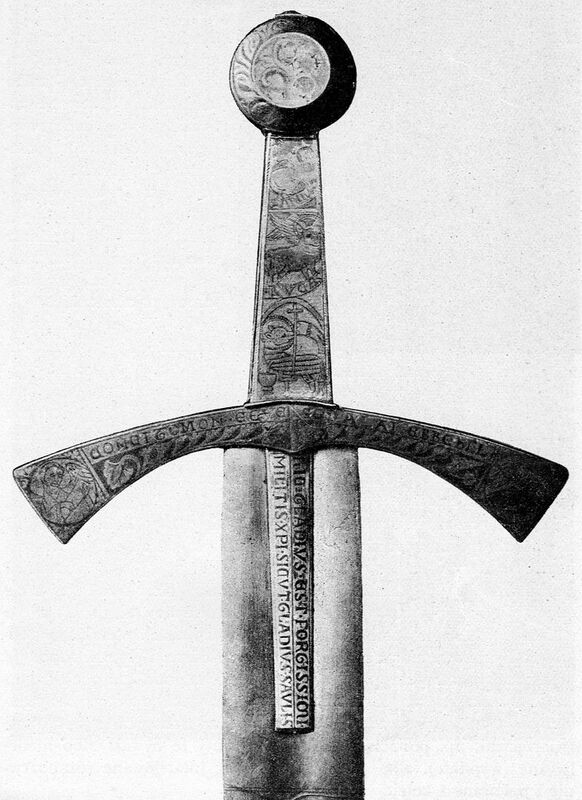 The inscription which mentions Bolesław could suggest that at least the hilt was made in Poland. Nothing can be said of the origin of the blade, at least not until it has been studied from a technological point of view. 1. The surviving regalia include another ceremonial sword which was used for giving the accolade and was originally owned by King Sigismund I (1506-1548). The sword was bought in England by the Polish colony in London after the second World War and offered to the Wawel collection. See "The Silver Sword of Sigismund I", The Connoisseur, July 1963, pp. 196-7. 2. 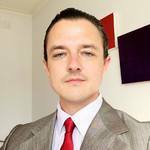 It is mentioned neither by Ada Bruhn-Hoffmeyer, Middelalderens tveaeggede svaerd, two vols., Copenhagen, 1954, nor by R. E. Oakeshott, The Sword in the Age of Chivalry, London, 1964. 3. The fullest bibliography is in the following: S. K. Kuczyński, O polskim mieczu koronacyjnym. Na marginesie artykułu M. Gumowskiego, Przegląd Historyczny, Vol. LII 1961, No. 3, pp. 562-577; M. Morelowski, "Szczerbiec", Studia do dziejów Wawelu, Vol. III (in press). 4. R. E. Oakeshott, op. cit., p. 51, fig. 25, p. 116, figs. 96 and 97, pi. 9 (sword from the grave of Sancho IV, el Bravo, king of Castille and Leon, ob. 1295), pis. 18 and 19, C (sword of "Santa Casilda").